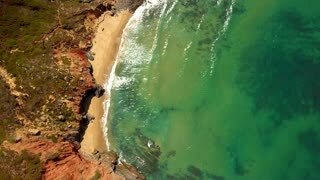 Aerial shot from above of tropical coastline with sandy beach and ocean waves running on shore in Tarifa, Spain. 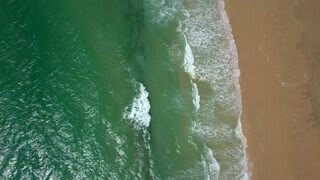 From above aerial shot of transparent ocean water running on sandy tropical beach on shoreline of Tarifa in Spain. 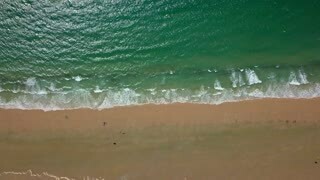 AERIAL: Flying above an empty brown sand beach and the emerald ocean waves.